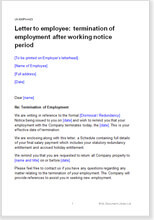 These letters are examples of the sort of letters you might write as a "first written warning" under your organisation's disciplinary procedure. They can be used as templates in their exact form but are most suitable as a starting point for ideas. You will need to think about the surrounding circumstances before re-constructing the letters. Net Lawman strongly advises you thoroughly investigate the law surrounding this area and only then take action. To avoid a tribunal claim or to win the case, it is essential that the appropriate procedures are in place and that you follow them. In particular, it is worth dealing very thoroughly and carefully with this step. Here you are setting out the subject matter of your complaint. This is the time to do your homework, take statements from everyone else involved, then present the employee with your case. A well drawn letter at this stage will enable your employee's adviser to see the full position and advise your employee accordingly. A bad letter will encourage an application to a tribunal. Other letters follow the procedure and assume that the first steps have been taken. Each letter has a slightly different approach depending on the subject matter of it. Managerial authority is always present, but there is more sympathy in some than others, depending on the degree of blameworthiness of the employee. The style of the letter is very important. A considerate, compassionate style may be important to preserve the goodwill of a faltering starter who is struggling to make the grade, but it is important to be very firm with for example, a blatant disregard of safety procedures.